After introducing a brand new Messenger app, Facebook announced new features and improvements for its social network app. Some of the new features revealed today will not be available right away, but at a later date, such as the option to add songs to a Facebook profile. Music on Facebook Stories is a brand new feature that allows Facebook users to add songs to photos and videos they share to Stories. But that's not all, as Facebook announced that it's bringing the same option to News Feed, which means that you can now take a photo or video from the Facebook Camera (or get one from the camera roll), then tap on the sticker icon and select the music sticker. Simply choose the song you want to attach to your photo/video and add the sticker with the artist and song name. You can also add other stickers and effects to customize a Facebook story. 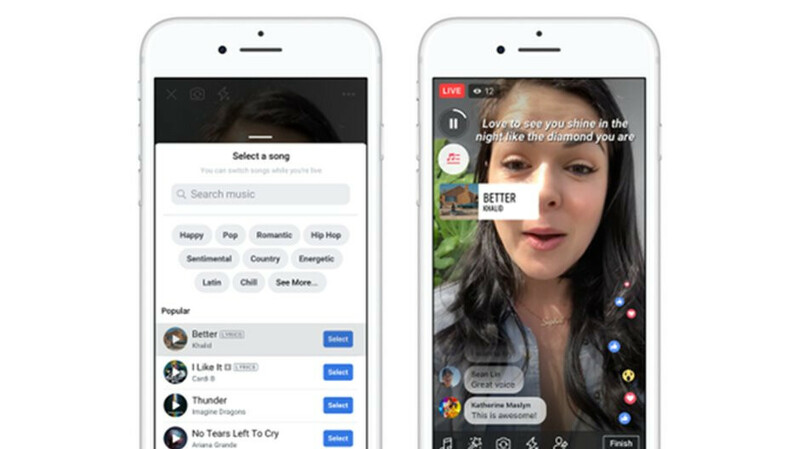 Besides the option to add songs to photos and videos, Facebook announced that it will expand Lip Sync Live availability to more countries and that it's opening up the feature to more artists and creators via Pages. To further enhance Lip Sync Live, Facebook is adding the option to see lyrics to songs while lip syncing. As mentioned earlier, a brand new feature that will allow Facebook users to add songs to their Profile will be launched soon. It will enable users to pin a song to the top of their profile to share with friends. Anyone who plays your profile song will hear a clip of the song and see a video featuring photos of the artists and album art. Then, they can take further actions like add the song to their own profile or visit the artist's Facebook Page.